The newly discovered focus on the Baltic Sea region cannot rule out Nordic peace and stabilisation engagement in the Global South, which continues to impact directly on the security of all three states. The idea of a unitary ‘Nordic model’ in international affairs is compelling. Nordic states share a common cultural, linguistic and historical heritage, have similar socio-economic political systems, and are committed to internationalized and institutionalised responses to international developments. Despite these similarities, however, a distinct Nordic model or Nordic identity does not exist in respect of security and defence. Following the Cold War, Denmark, Norway and Sweden chose widely different paths in their respective commitments to peace and stabilisation efforts. However, the European security environment has changed recently, and as a result the three countries are increasingly aligning their policies. After the Cold War, Denmark reacted rapidly and radically to the transformed security order in comparison to its Nordic neighbours. Policy-makers in Copenhagen showed an increasing willingness to take risks and use various means of conflict resolution, including military ones, to assume an active role in international affairs. Denmark contributed to UN peacekeeping in the 1990s, a decade that in Europe was dominated by the break-up of Yugoslavia, and it became the largest per-capita troop contributor to the United Nations Protection Force (UNPROFOR) in Croatia and Bosnia-Herzegovina. Subsequently, Denmark took part in the non-UN Security Council-­authorised NATO intervention in Kosovo in 1999 and it became a strong supporter of NATO’s new role in ‘out-of-area’ conflict-management. Reflecting its new outlook, the 2004 Danish defence agreement shifted the focus of the armed forces from territorial defence to international conflict management. In a more benign post-Cold War environment, Denmark saw international peacekeeping and stabilisation as a way to promote international (and national) stability, strengthen relations with key allies, especially the US, and promote state-building that still reflected the values and norms of the Danish welfare state. The decision to join the US-led wars in Afghanistan and Iraq in the early 2000s reflected this shift towards the political cementing of military force as a legitimate foreign-policy instrument. In Iraq, Denmark was the only Nordic country to participate militarily in the initial intervention in 2003, leading to a significantly more Americanised and militarised security and defence policy during the 2000s. Indeed, NATO, led by the US, became the framework in which Danish conflict management was defined. This circumstance was further accentuated by Denmark’s opt-out from the EU’s Common Security and Defence Policy (CSDP). Territorial defence has remained the raison d’être of Norway’s security and defence policy because of the country’s geographical proximity to Russia. 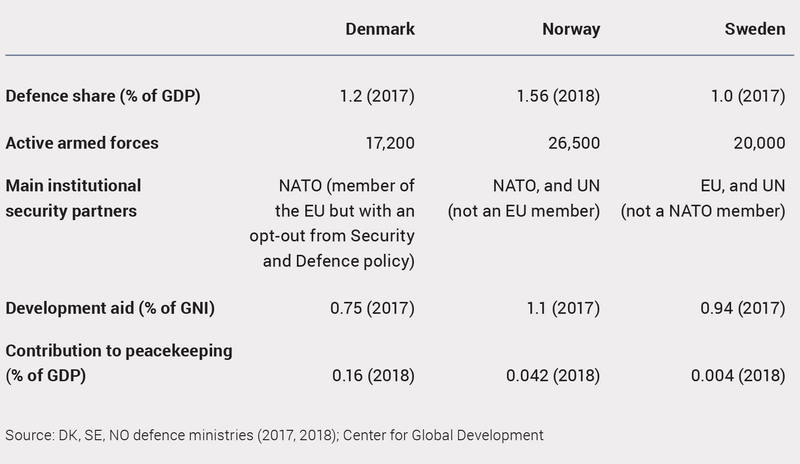 Various Norwegian governments have therefore hesitated to engage in international peacekeeping and stabilisation efforts, and when they decided to do so, they usually deployed low-risk units. Contributions were made during the 1990s to international operations in the Balkans, but only in support functions, and without taking part directly in combat activities. That said, Norway’s security policy is driven by its support for multilateralism and the promotion of the values of democracy and human rights as crucial to peace and security efforts. Throughout the 1990s, Oslo’s stance changed, and in the new millennium the Norwegian government has increasingly trained, organised and equipped its troops to play a role in military operations abroad. Nonetheless it remains the policy not to deploy Norwegian troops in high-risk areas. In Afghanistan they were not stationed in Helmand, unlike Danish troops, but operated in the country’s more peaceful and less dangerous northern provinces. 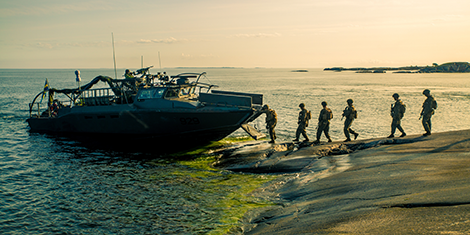 NATO remains the critical security framework for Norway. Oslo was initially sceptical of NATO’s out-of-area conflict-management role, but it has contributed consistently to the organisation’s missions. Norway has also continued to support the UN system, especially the Department for Peacekeeping Operations (DPKO). For Sweden, the 1990s were characterised by a gradual departure from its three Cold War principles for defence and security: independence, neutrality, and military non-alignment. This stance gave way to a more proactive role in international peacekeeping and stabilisation through multilateral forums such as the UN, NATO and the EU. The country engaged in international peacekeeping work in the 1990s, being, for example, one of the most active contributors to UN missions. Sweden also took part in NATO’s take-over from the UN in Bosnia-Herzegovina in 1995, despite not being a NATO member (Sweden became a member of NATO’s Partnership for Peace programme in 1994). Sweden became a member of the EU in 1995 and has since become one of the most fervent supporters of the organisation’s timid security and defence policy. The EU’s largely normative, anti-power role in global affairs fits Sweden’s international self-perception well. Today, it is Sweden’s most important institutional framework for matters of foreign and security policy, in stark contrast to Denmark, which has opted out of this policy, and Norway, which is not an EU member. Like Denmark, however, Sweden has refocused its army to concentrate primarily on participation in internationally mandated conflict management, and it indicatively abolished conscription in 2010. Like Norway, Sweden is much more reluctant to use military force when engaging in international peacekeeping. This has less to do with the fact that Stockholm considers the Swedish armed forces mainly as an instrument of territorial defence, as Oslo does, and more to do with the fact that Sweden sees the use of force as morally problematic, despite being the third largest arms exporter per-capita in the world. In recent years, the immediate security environment around Europe and the Nordic states has shifted. To the east, the perception of a Russian threat has returned, following the Russian annexation of Crimea in 2014. To the south, conflict and poverty in the Middle East and Africa are framed as having direct security implications for the European continent in the shape of migration and terrorism. In response, within the past few years, Denmark, Sweden and Norway have all been upgrading their security and defence policies to focus on regional security and territorial defence. In this context, a new awareness has emerged among politicians and policy-makers regarding the Nordic community and the potential for cooperation in security and defence. For instance, suggestions are being made to strengthen the sub-regional coordination forum, NORDEFCO. It was established in 2009 to focus mainly on industrial cooperation and budgetary issues, but has shifted its emphasis to also include defence policy. However, the Nordic states are also small and cannot go it alone. To succeed in promoting regional stability in the Baltic Sea region as well as maintain a focus on the challenges emanating from the Global South, ad hoc, sub-regional coordination is insufficient. The Nordic states are greatly dependent on international institutions, both regionally (NATO, EU) and beyond (UN). NATO remains the primary framework for European – and Nordic – security cooperation. However, the election of Donald Trump as president of the United States has accentuated a trend away from an international system of institutionalised cooperation between nations, as exemplified by his questioning of the security guarantee among NATO allies, the fundamental value of the alliance. This uncertainty makes it even more crucial to ‘talk up’ multilateralism and institutionalised responses that tie in other countries (not bemoan how inefficient they are). In this regard, the EU and UN are not secondary to NATO, but may offer the best option in producing a common front – as they have often done. Working multilaterally evidently does not come without challenges. The three countries each have their own awkward relationship to key western security institutions: Denmark has its EU defence opt-out, Sweden is a non-NATO member of the EU, and Norway is a non-EU member of NATO. These conditions challenge consistency and coherence, but the three states may be able to use these different relationships and memberships to their advantage. By means of joint policy planning at the political and operational levels, the three should work to formulate common interests and promote them within key multilateral forums, thus giving themselves a stronger collective voice. Certainly, the shift in the perceived threats to the three countries, as well as to Europe more broadly, has localized the pressures on Nordic stability. However, this does not mean that solutions to these challenges are in fact local or that they do not extend far beyond Denmark, Norway and Sweden. Christine Nissen is a Research Assistant at the Danish Institute for International Studies (DIIS). Peter Albrecht is a Senior Researcher on Peace, Risk and Violence, at the DIIS.